A Movie Review by David Vineyard: THE LADY IN THE CAR WITH GLASSES AND A GUN (2015). THE LADY IN THE CAR WITH GLASSES AND A GUN. France, 2015. French title: La Dame Dans L’Auto avec des Lunettes et un Fusil. Freya Mayor, Benjamin Biolay, Elio Germano, Stacy Martin. Screenplay by Gilles Marchand and Patrick Godeau, based on the novel by Sèbastian Japrisot. Directed by Joann Sfar. In any good suspense story, one key element is how fate intervenes. A small misdeed can be blown out of all proportion, a moments misstep can derail a life, adventure is a single step away, but so is danger. For Dany Doremous (Freya Mayor), in Sebastian Japrisot’s novel, and this 2015 French production adapting it, the only crime she ever commits in her life both saves it, and plunges her into jeopardy and doubt of her own sanity. Neurotic nearsighted Dany Doremous is a secretary in Paris circa the late sixties or early seventies for Michel Caravelle (Benjamin Biolay) whom she has a crush on. When he asks her to come to his home, just before a bank holiday begins, to finish some paperwork for the ad agency she works at, she wants to say no, but can’t. There she is reunited with Anita (Stacy Martin), Michel’s wife, a rather bitchy girlfriend she started in the secretarial pool with eight years before. Staying overnight to finish the papers, she is asked by Michel to drop his family off at the airport for a flight out and drive their Thunderbird back to their house, but on the way back from the airport Dany doesn’t take the turn toward Paris, she takes the turn South, toward Cannes and the South of France. She has never seen the sea. Almost immediately things spiral out of control. People keep mistaking her for someone else, a woman who passed the night before and earlier that morning in the same car. At a gas station she is attacked in the ladies room and her hand is viciously injured, so she has to have it bandaged, but no one believes her and all believe she was there the night before when she was sleeping at her employers. That night she picks up a man, Georges (Elio Germano), they make love, and the next day she drives him south, but as soon as he can he steals her car. With the help of a friendly truck driver she finds the car — and in it the dead body of a man, and when Georges shows up he swears she killed the man. They try to dispose of the body, argue, and he knocks Dany out, but when she comes to, Georges is dead too, murdered. Desperate, Dany calls her boss for help, only to find she is in even more danger. The film has a noirish dream-like quality, handsomely shot on location and very much a star turner for Mayor, whose long legs, large eyes, and flame red hair and freckles behind large glasses give Dany a vulnerable almost otherworldly quality. Stylish and beautiful to look at, the film is not hard-hitting suspense as much as a modern noir fable about a young woman coming into her own, a kind of Cinderella or Sleeping Beauty awakened from the dull dream her existence has been up to now, through terror, madness, and in blood. That fairy tale reference is no accident. One of Japrisot’s early novels was A Trap for Cinderella. The book this film is based on was a bestseller, and came to the screen before in 1970, the last work of director Anatole Litvak, with a screenplay by Japrisot himself, and starring Samantha Eggar and Oliver Reed. That version was a gorgeous eye-popping tour of gorgeous locations, Christian Dior fashions, pop art colors, and twisty plot. I’ve always found it a much better film than critics of the day did, though the Hitchcockian elements of the plot are perhaps lost in the eye-popping look of the film. I’m not sure it has ever been on DVD, though a rather mediocre print was available on YouTube. The French version is available both on DVD and currently on Netflix. Don’t mistake this later version for nerve-jangling suspense in the American style. Nothing leaps off the screen at you or says boo. It is very much a dreamy mood piece, but a truly attractive adaptation of a bestseller of the past by a French master of the suspense novel, with a truly puzzling plot that is actually neatly and logically resolved. A Locked Room Mystery Review: WARREN B. MURPHY – Leonardo’s Law. WARREN B. MURPHY – Leonardo’s Law. Carlyle Books, paperback original, 1978. PaperJacks, paperback, 1988. Along with co-author Richard Sapir, Warren B. Murphy was the creator of Remo Williams, aka The Destroyer, who appeared in nearly 150 men’s adventure novels over a period of some 35 years, many of them ghosted all or in part by other writers. In Leonardo’s Law, Murphy tried his hand at the classical detective novel, with decidedly mixed results. Let’s take Leonardo first. He’s Doctor David Vincent Leonardo, a professor of mathematics at a small college in Connecticut who also has a small interest in solving crimes, although this one is the only one of his ventures in that regard to have seen print. He is also something of an enigmatic genius, with additional degrees in philosophy, anthropology and psychoanalysis, among others. Dead is Barry Dawson, writer of mysteries, who is found dead in his study — the usual blunt instrument — in a room with a door that can be locked only from the inside, and in his hand is the only key, along with a tie-tack that Inspector Drossner, dashing representative of the Connecticut State Police with a fine eye toward good press coverage, is sure will lead directly to the killer. Leonardo demurs. Telling the story is Lt. Anthony Jezail, second-in-command of the local Walton police force, a sour-minded misanthrope who thinks very poorly of the world and believes that all those with more power than he are idiots, and who says so at length and often profanely. It does not help matters that he is correct, beginning with Police Chief Waldo Semple, a man who can barely be trusted with a gun. As far as the solution to the locked room mystery is concerned, which in many respects is an audacious one, Murphy proves to be more than adequate in misdirection and yet providing all of the details you might need to solve the case yourself, maybe. What I don’t understand is the need to make Jezail not only a bitter observer of humanity in general, but a victim of virulent homophobia as well. A Science Fiction Review by Dan Stumpf: JOHN WYNDHAM – Out of the Deeps. JOHN WYNDHAM – Out of the Deeps. Ballantine #50, US, paperback, November 1953. Michael Joseph, UK, hardcover, 1953, as The Kraken Wakes. Reprinted several times under both titles. *All over the world, great slimy monsters crept out of the seas — to feed on human flesh! I think “slimy” is a nice touch; don’t you? In any case, this is a fast-moving and fairly gripping tale of one of those idiosyncratic Alien Invasions typical of British Sci-Fi, unfolding over a period of several years and narrated by a journalist of the Clark Kent school: handy at crucial moments, and observant enough to see the implications. It all starts conventionally enough as strange objects streak to Earth from somewhere around Jupiter and mostly plunk into the ocean deeps, except for a few that streak across the U.S. and/or Russia and are promptly shot to space-smithereens, since this was at the height (or depth, if you prefer) of the Cold War. Some time passes before the Government organizes a research team that includes our narrator and the usual insightful, eccentric) and politically inconvenient) Scientist to see what became of the things, leading to a suspenseful chapter where bathyspheres are dropped, only to have loose cables hauled back up, severed and fused by some awesome heat. Things progress from here to worse: depth bombs are dropped, ships disappear, then more ships, and finally whale-size blobs start crawling out on land, discharging “millebrachiate tentacular coelenterates” (big honkin’ jellyfish) to devour the locals. There are some really fine pages of pitched battles with the damn things until (SPOILER ALERT!) they put the blighters to rout, And everyone slaps himself on the back for vanquishing the foe…. And then, very slowly, the polar ice caps start to melt — and at this point the whole thing got unbelievable. The thing is, there’s a strong subtext in this book of Official dithering and Politicized inaction. Wyndham spreads his story over years, with connecting phrases like “It was not till months later…” or “the following summer…” and that sort of thing. The icecap-melt uses a lot of these, as elected officials all over the world argue over what’s going on and whose fault it is. Well, I don’t know about you, but I find it hard to swallow the notion that responsible elected officials, faced with clear evidence of climate change, would mostly just ignore it. There’s even a short bit about New Orleans getting flooded… makes the whole thing unbelievable. If you can get past this, however, there’s some good reading here, with large-scale catastrophe, small-scale personal crises, and a real feel for the characters involved. What impressed me most though was that Wyndham brought this whole epic in under two hundred pages. If it were done today, he’d have to spend five volumes detailing pointless subplots and diversions to tell the same damn story. No wonder I miss the fast, sharp writing of yester-pulp! Archived Review: GEORGE BAGBY – The Original Carcase. GEORGE BAGBY – The Original Carcase. Doubleday Crime Club, hardcover, 1946. Jonathan Press Mystery J71, digest-sized paperback, abridged, no date stated , as A Body for the Bride. Time out for a lesson in the antique furniture business. First of all. the word carcase — a more elegant word for carcass — has the meaning you think it has, but it’s also the large bottom cupboard space found in antique dining-room sideboards. Of course, it’s also true that if certain partitions were removed, there’d be room enough to stuff a corpse for safe-keeping, and so it happens, to the newly-wed neighbors of George Bagby. That the husband’s brother is a retired gangster of no little repute, and known for a long time by Bagby’s friend Inspector Schmidt, is also worth pointing out. There never was a night like this in the old days, as even the old bootlegger is forced to admit, and as morning arrives, another killing occurs, and things get even goofier for a while. Schmitty is never at a loss for theories, however, and a final round-up of the suspects leads to a climactic solution scene that lasts for all of twenty-five pages. Except for an unexplained lapse on the part of one of the characters, which makes him an unwitting accomplice of the real killer, this is really a fine example of how the light touch can liven up the serious business of police work– as long a it’s the events that amuse rather than characters that are utterly wacky. Reviewed by Barry Gardner: PETER ROBINSON – The Hanging Valley. PETER ROBINSON – The Hanging Valley. Alan Banks #4. Charles Scribner’s Sons, US, hardcover, 1992. Berkley, US, paperback, 1994. First published in Canada by Viking, hardcover, 1989. Robinson’s Yorkshire detective, Chief Inspector Alan Banks, has gotten some pretty good ink from the critics. As a confirmed village mystery lover, I’d place him somewhere in the mid-ranks. Here, a faceless, maggot-ridden corpse is discovered in a tranquil valley. Links are suspected with the disappearance five years earlier of a private detective, still unsolved. The villagers aren’t talking. Eventually, the case takes Banks to Canada in search of the truth. I find Banks to be a moderately realistic, moderately engaging character, and Robinson’s writing to be quite good. There’s a very good story of an abused wife mixed in with the mystery, and the characterizations are well done. The ending is distinctly offbeat and unexpected. No raves, but a good solid read if you like village mysteries. — Reprinted from Fireman, Fireman, Save My Books #5, January 1993. Bibliographic Note: Including Sleeping in the Ground, scheduled for publication in 2017, there are (or will be) 24 books in Peter Robinson’s Inspector Banks series. A Western Review: MAX BRAND – Valley Thieves. MAX BRAND – Valley Thieves. Dodd Mead, hardcover, 1946. Reprinted many times, including Pocket #668, paperback, January 1950. First serialized in Western Story Magazine, Oct 28–Nov 25, 1933. Jim Silver, also known as Silvertip, so called for the small tufts of gray hair up above his temples, comes on the scene relatively late in this tale, but the story’s a doozie from page one on. A newcomer to the West, a bold braggadocio of a man, but likeable for all that, tells a woman who has quickly caught his fancy that he can bring her Jim Silver’s horse for her to ride, but not only that, but the wolf who is the man’s constant companion. No one, of course, believes him, but lo and behold, that is exactly what he does. But then disaster happens, as both horse and wolf are stolen from him. It seems that Barry Christian, Silver’s mortal enemy, recently escaped from prison, may have had a hand in it, but no matter who the thief may be, it is essential that both Parade and Frosty must be found and returned to their master. When it comes to the Silvertip series, Max Brand was not just writing westerns, he was writing legend. He was writing mythology. Jim Silver is the purest, the most honest man you could ever hope to know, and if he is on your trail, you had best never sleep at night. The result, the book at hand, is one with the substance of cotton candy, and as enjoyable. To allow the series to continue, or so my sense of the matter is, the tale ends both a little abruptly and predictably, but until then, it’s a mile a minute through some of well-designed Western prose you’ll ever read, bar none. 2. The Man from Mustang,	1942. 6. The Fighting Four, 1944. 9. The Stolen Stallion, 1945. 12. The Valley of Vanishing Men, 1947. 13. The False Rider,	1947. This list is tentative and subject to verification. Publication dates are of those of the hardcover editions, not the prior magazine versions. A Mystery Movie Review: THE 13th MAN (1937). THE 13th MAN. Monogram Pictures, 1937. Weldon Heyburn, Inez Courtney, Selmer Jackson, Matty Fain, Milburn Stone, Grace Durkin, Robert Homans, Eadie Adams. Director: William Nigh. When it comes to the movie The 13th Man, there seems to be a large disconnect between me and the rest of the IMDb film-watching universe. The latter has given this rather turgid mystery melodrama an accumulated 5.9 stars, and I would be hard pressed to give it two. The basic premise is not bad. The current District Attorney, with a highly contested election coming up, reminds his radio audience that he has put 12 major crime figures behind bards so far, and on the next day he will be starting indictment proceeding on a 13th major underworld figure in the city. Which well-deserved individual will it be? This is the kind of city where there are any number of candidates. But will the D.A. survive till the next morning? You can answer that at once. He dies at ringside that same evening with a curare dart found in his neck. Investigating the case one step ahead of the police are radio reporter Swifty Taylor (Weldon Heyburn) and his secretary (who is secretly in love with him), Julie Walters (Inez Courtney). Swifty, it seems, is not all that swift. But from this point on, the story and the no-name cast go absolutely nowhere. It is one of those movies that make your eyeballs ache just watching it, but sometimes an investment of 20 minutes into a movie makes you want to keep watching it, just in case something interesting happens. There is one twist that I probably should have seen coming, but I didn’t. I can’t tell you what it is, just in case you decide to ignore these comments of mine. Perhaps the no-name cast has more of a name than I realize, but the only two actors who show any enthusiasm for being in this movie are Milburn Stone (then a mere 33 years old), playing Swifty’s assistant, and considerably more elderly Robert Homans, who often had small roles as policemen in his movie-making career, and so he was once again in this one. The real culprit is intended as a surprise, but not quite picking a name from a hat, he (or she) was exactly who I suspected all along. A 1001 MIDNIGHTS Review: LINDA BARNES – Bitter Finish. LINDA BARNES – Bitter Finish. St. Martin’s, hardcover, 1983. Fawcett, paperback, 1985. Dell, paperback, 1994. Michael Spraggue is falling down a flight of steps, the voice of his stunt instructor screaming at him to use his thighs and hips to break the impact of the sharp cement. As the star of Hollywood’s latest private-eye melodrama, shooting on location in Boston, Spraggue leaves the car chases to the pros, but the light stunts he likes to do himself. An independently wealthy ex-private investigator turned actor, he’s quit the business because he’s “mostly dug up dirt everybody would have been better off not knowing.” But an emergency phone call summons him back to California’s Napa Valley, where Kate Holloway, his not quite ex-lover and longtime business partner in the Holloway Hills Winery, is in jail as a material witness to murder. Kicking and screaming (he really does hate being a private eye), Michael flies to the rescue. The victim is Holloway Hills’ flamboyant Hungarian winemaker — the second in what the papers are calling the “car trunk murders.” Kate is notorious in the valley — she’s six feet tall, gorgeous, and makes as good a wine as many male vintners — and the not-so-bright deputy sheriff is certain she’s a killer as well. Michael seems to be the only person on the scene smart enough to figure out who stashed those cadavers in the trunks of cars, and the deputy sheriff, of course, won’t talk to him. The complicated love situation between Spraggue and Kate is probably the most interesting part of this story, although Barnes does give us a lovely picture of the Napa Valley at harvest time and lots of detail on the wine making industry. The action moves well, the clues are nicely hidden, and the reader isn’t bored — but neither is the reader glued to the edge of his seat. Spraggue ends up, predictably, all by his lonesome with a crazed killer in a deserted winery at the end of a rarely traveled road. The writing is light, entertaining, and stylistically sound; and hopefully as Linda Barnes matures as a writer, so will Spraggue and company. Michael Spraggue also appears in Dead Heat (1984). Bibliographic Notes: Spraggue’s first appearance was in Blood Will Have Blood (1982). A fourth and final book in the series was Cities Of The Dead, published in 1986. In 1987 Linda Barnes switched series characters and wrote A Trouble of Fools, the first of twelve novels featuring cab-driving PI Carlotta Carlyle, based in Boston. 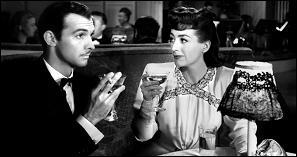 A Movie Review by Dan Stumpf: MILDRED PIERCE (1945). MILDRED PIERCE. Warner Brothers, 1945. Joan Crawford, Jack Carson, Zachary Scott, Eve Arden, Ann Blyth, Bruce Bennett, Lee Patrick, Moroni Olsen, Veda Ann Borg. Screenplay by Ranald MacDougall, based on the novel by James M. Cain. Director: Michael Curtiz. I recently saw Mildred Pierce and came away just dumbfounded that anyone – even a Movie Critic – could watch this movie and fail to notice the strong, even idiosyncratic, hand of director Michael Curtiz at work. 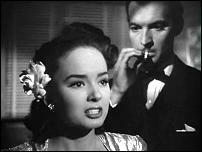 Take the opening: A mildly-surprised-looking Zachary Scott, seen in a mirror, shuddering under the impact of bullets hitting his frame, even as the mirror splinters and shatters, just as he hits the floor and rolls into full close-up before our eyes. In terms of screen time, it’s only a few seconds, but visually, it’s an incredibly complex blend of deft mise-en-scene and seamless editing, knowingly orchestrated by a master of the form. Surprisingly enough, Curtiz manages to steer the film from this dizzy beginning through a palpaceous plot of Mother Love, Teenage Lust and Middle-aged Greed without once letting the pace falter. He keeps it right at the hungry edge of violence, like an addict staring at a needle, for nearly two hours’ fast-paced running time, and gets deft performances along the way from the likes of Bruce Bennett, Zachary Scott, Eve Arden, Ann Blythe and — inevitably — Joan Crawford. Ah yes, Joan Crawford. In the role that revived her career. The cult of her personality, I fear, has always obscured the virtues of this remarkable film, just as Bogart’s cult “obscured” Casablanca: by shining so much Star Power on it that it ceased to be a film, and became instead a shrine, whence the Faithful are called several times a year to bask their idols in adoration. Which offers a clue to Curtiz’ critical neglect: He was so good at enshrining major personalities (including Flynn, Cagney, Bette Davis and even Boris Karloff) that their fans always tended to overlook him — forgetting that gods do not exist until someone builds temples to them – and critics never noticed the consistent stylistic complexity that he lavished on even his minor films. Thus he became an “anonymous” director to folks who just wasn’t looking. Getting back to Mildred Pierce, though, it’s a lavish blend of Mystery, Soap Opera and even pre-feminist rhetoric, and though the icons who populate this particular temple have remained somewhat critically unfashionable, the showcase itself deserves a fresh look. You are currently browsing the weblog archives for September, 2016.